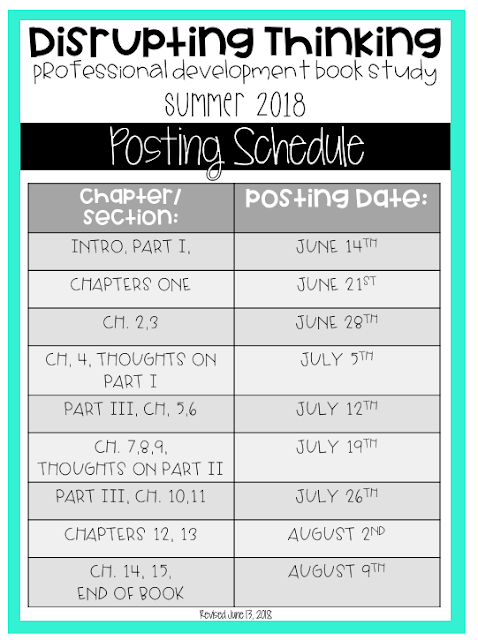 So let's talk chapter 4. This chapter was all about how students need to be compassionate readers. 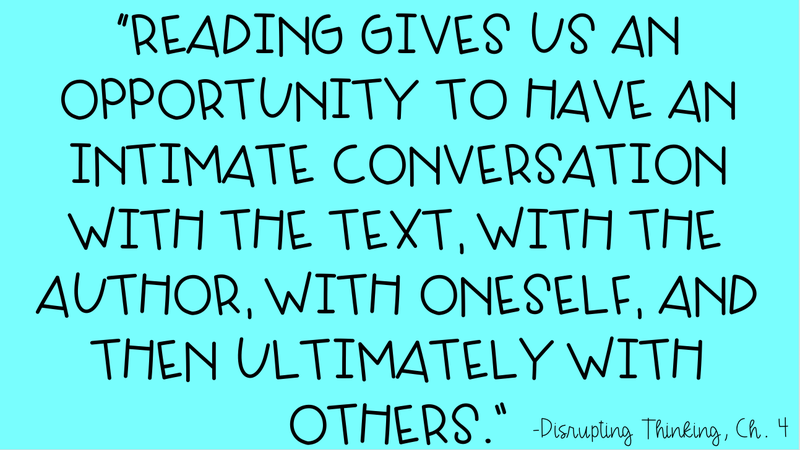 Although this sounds like a simple concept, I have found this to be difficult when teaching reading. 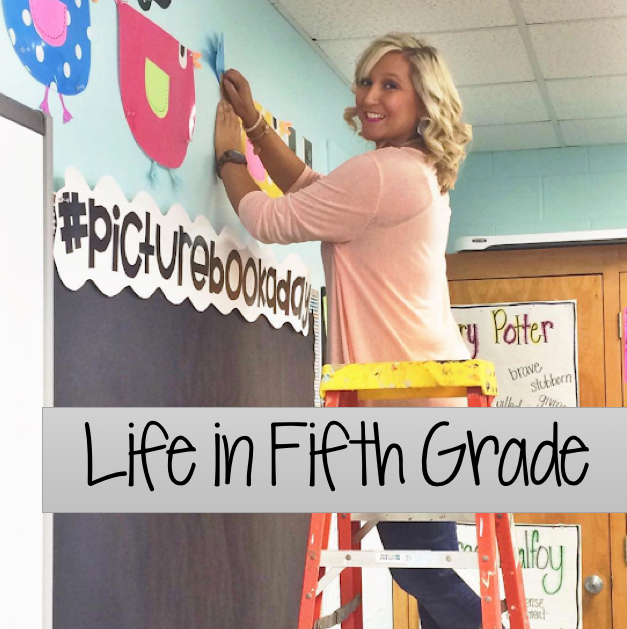 It is so hard to get kids to put themselves in the reader's shoes and communicate how they would feel if they were put in a situation that the character found themselves in. So often, they just want to answer with things that are happening in the text and leave their feelings out of it. Did this statement stick out to anyone else? I gotta say, it really resonated with me and then left me a little confused. There's a fine line between just letting the kids read and response to the text and actually teaching them how to do it, and sometimes while I'm reading this book, I'm overwhelmed and unsure of how to go about it. I want more than anything for my kids to love reading, but I also want them to know how to read and comprehend and response to the text. I mean, sometimes a "sticky note" is needed, right?? How do you get them to develop a love for reading and not smother them with sticky note tasks, while at the same time actually teaching them useful strategies?? This is another statement that I highlighted. This year, I really want to teach my kids to respond to the text as it relates to them, but I also want them to share their thoughts with others. I think literature circles will really help with this. Y'all know I struggle with nonfiction. 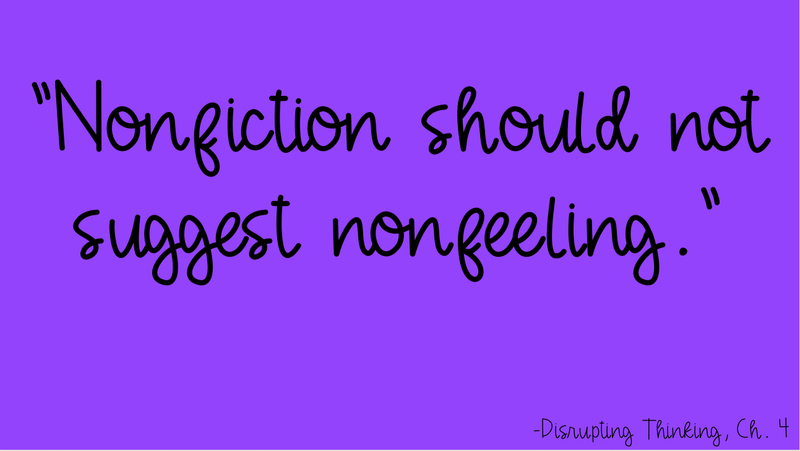 I always have to force myself to incorporate more nonfiction into my lessons. 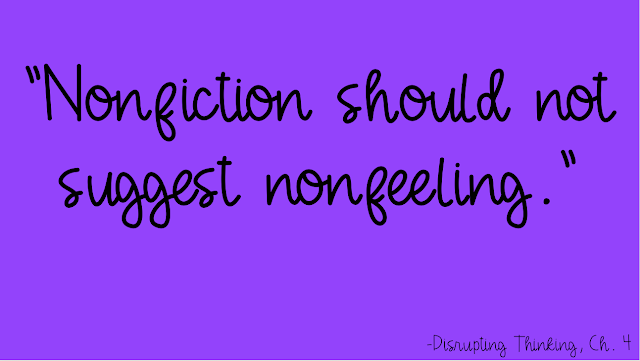 Fiction just comes naturally to me, and I always lean toward that type of text, but I really liked what this chapter said in regards to being a compassionate reader when reading nonfiction. I think this is so important now more than ever. The book used the 2016 election as an example and that really hit home with me. We need compassionate readers (and people!) now! I agree that there were some things in this chapter I didn't 100% agree with. Although we don't answer multiple choice questions about what we read, or write summaries or book jackets, we do give highlights to friends and respond to blog posts about what stuck with us :) As great as it sounds to let kids just read to read, we are still trying to teach them how to do that and make sure they're understanding. Otherwise they'll be irresponsible readers- believing fake news and telling incorrect facts about a text. I really loved the part about empathy and compassion. My "word" last year in my room was empathy, and I tried to connect a lot of what we did to making more empathetic citizens. But now maybe it should actually be "compassion." CIVILITY, GENEROSITY, KINDNESS. Love it! I really enjoyed this chapter. As a special education teacher, I work with students struggle with reading (and many who hate it). The chapter reinforced my current practice of tons of discussion and fewer worksheets. 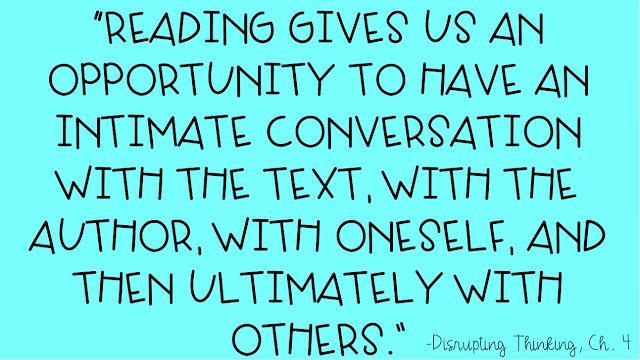 To be a compassionate reader, we also need to be responsive to the text. I think the authors are asking us to help our readers to interact with the text on an emotional level and they can't do that without first comprehending the text. I use quite a bit of nonfiction in my classroom, and many current events lend themselves to compassionate discussion and thought. I really love News ELA and Action Magazine for their nonfiction articles. Nikoline - I like how you have a "word" of the year. I think I'm going to use compassion in my room. Thanks for the idea! I feel like this chapter hits hard on where our country is at this moment. We could all use a little more compassion in our lives, and that is a really hard concept to teach children. I think being a compassionate reader is what makes someone love reading. For me, if I can't connect to a character in a novel, I will struggle to make it through or just abandon the book. I highlighted the sticky note quote too. I know that I have my students write responses or summaries to what they are reading on sticky notes or in the margins as a way to monitor and assess their comprehension with something tangible. I think this is where I need to increase the conversation time my students have with a text to assess their comprehension and connections. I feel that compassion is hard to for kids, they tend to get easily embarrassed (fifth grade boys in particular!) This spring we read Dark Water Rising and connected it to a documentary filmed days after Katrina (a documentary about rescuing dogs). The characters in Dark Water Rising do not talk about what they felt after seeing the death and destruction which led to very mature and compassionate discussions about why the characters might have remained silent and what they (the students) may have felt and done. Again, as stated in the first few chapters... this story is relevant and allows for them to connect in ways where they can be responsive and raise questions. As far as sticky notes, I also highlighted that quote. I feel that the sticky notes aids in meta cognition but that the conversations need to outweigh them. This chapter really hit home with what is happening in the classroom. We are encouraging efferent readers who in the end become to hate reading. When day ends and I grab my book to decompress I do none of these things that I expect my students to do when reading. I get lost and often laugh, cry, bite my fingernails and sit with anticipation on what is going to happen next. We definitely need to change the way we are creating or not creating readers. 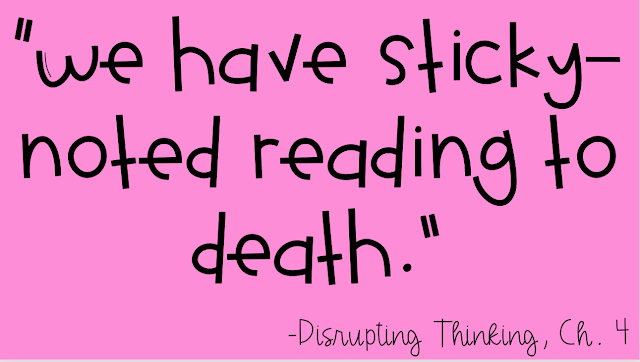 Hi... Are you going to continue the Disrupting Thinking book study?? ?